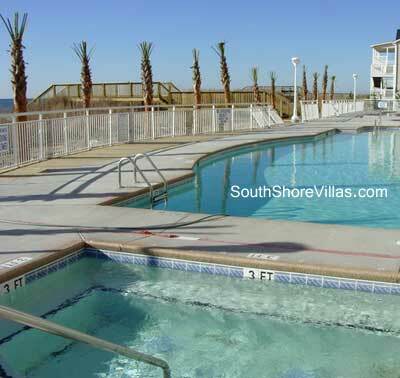 New Oceanfront Condos in North Myrtle Beach - South Shore Villas, one of the most exclusive oceanfront condos in North Myrtle Beach, has completed construction and celebrated its Grand Opening for the Summer 2005 season. This newer resort property was meticulously planned and carefully built with the discerning vacationer in mind, featuring breathtaking views of the beautiful blue Atlantic Ocean, while being conveniently close to all the fun-filled attractions on the Grand Strand. 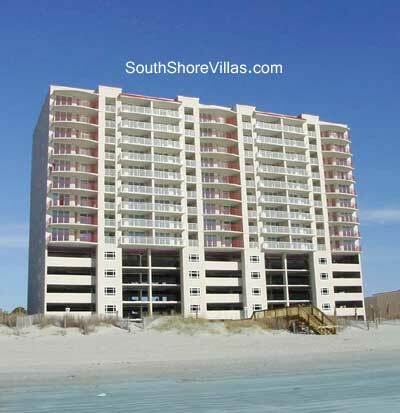 Located oceanfront at 1401 South Ocean Boulevard in the Crescent Beach section of North Myrtle Beach, developers of South Shore Villas planned and built a mere 63 luxury condos, and ALL of these new condos are oceanfront condominiums with King beds and unobstructed ocean views. This new luxury oceanfront resort also features fully equipped kitchens, washers and dryers, glass elevators and on-site covered parking for guests. See the photos page fo interior views of one of the exclusive condominiums. Keep in mind that we will continue taking additional interior photos of this new property. 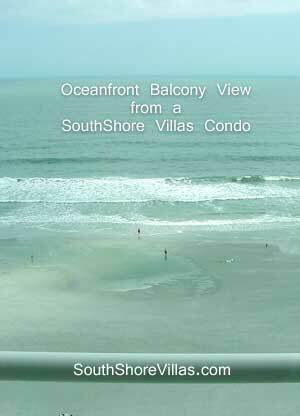 Below is a photo from an oceanfront condo balcony at South Shore Villas, and the floor layout of the resort property. Copyright © 1999-2012 Myrtle Beach Inc. All Rights Reserved.